LESSON XII - THE TIME EXPLAINED. - Dan. 9: 1-27. Lessons From the Book of Daniel LESSON XII – THE TIME EXPLAINED. – Dan. 9: 1-27. LESSON XII – THE TIME EXPLAINED. – Dan. 9: 1-27. 3. What did he do? Verse 3. 4. For what objects was the burden of his prayer? Verses 16,17. 6; While he was praying, who came to him? Versos 20, 21. 7. What did he first say to Daniel? Verse 22. 8. When was he commanded to come and explain the vision? Verse 23. 9. How did he say Daniel was regarded in the heavenly courts? Verse 23. 10. How long a time did Gabriel say was allotted to Daniel’s people and city? Verse 24. 11. What events would occur during that period? Verse 24. 17. When was Jesus crucified?—In the spring of A. D. 31. See “Sanctuary and Its Cleansing,” pp. 82-90, and “Christ Our Advocate,” No. 128 Bible Students’ Library. 1. As EXPLAINED in note 1 of lesson 10, the third year of Belshazzar was the last year of his reign, and hence coincided with the first year of Darius. This brings the vision of chapter 9 in the same year as the vision of chapter 8, hence only a few months apart. This makes a close connection between the two chapters and the prophetic periods found in them, and greatly strengthens the argument in favor of the seventy weeks being a part of the 2,300 days. 2. DANIEL’S mind still rested on the vision of chapter 8, and especially upon that portion which had not been explained, namely, the holy city and its sanctuary, and the time. In fulfilling the commission which Gabriel had received to make Daniel understand the vision, he would certainly begin at the point where he stopped in his explanation as recorded in the previous chapter. He had explained the symbols, and now he begins at once to give an exposition of the time. See verse 24. 3. THE commandment to restore and build Jerusalem consisted of three decrees (Ezra 6: 14), the last of which, and hence the one which completed the commandment and from which we must begin to reckon, was the decree of Artaxerxes Longimanus, B. c. 457. See Ezra 7 for the decree, the date of which is in the margin. 4. FROM B. c. 457 sixty-nine weeks, or 483 years, would reach to A. D. 27. In the fall of that year Jesus was baptized, at which time He was anointed by the Holy Spirit. He was then the Messiah, which means the Anointed One. See date in the margin of Mark 1:14, 15. 5. NATURALLY the first division of the seventy weeks would be devoted to restoring and building the city. Hence the first seven weeks are allotted to building the wall of the city, which was accomplished in B. c. 408, in the reign of Darius Nothus. 6. AFTER placing before Daniel the great events connected with the seventy weeks, the restoration of the city and the sanctuary service, the coming of the Messiah, and His cutting off, and His causing the typical services to cease by the sacrifice of Himself, he then reveals to Daniel the utter destruction of the city and sanctuary toward which he and his people looked with such fond desire. In this way the great truth was taught that the sanctuary to be cleansed at the end of the 2,300 days cannot be the one destroyed in A,D. 70 by the Romans under Titus. 7. CHRIST was to confirm the covenant with many for one week. This was the last week of the seventy. Seven weeks were allotted to the building of the wall, then sixty-two weeks more would reach to Messiah. These added would make sixty-nine weeks, which would reach to A. D. 27. Then for three years and a half, or during His public ministry, Christ confirmed the covenant in person among the Jewish people. This refers of course to the new covenant, the blood of which was shed on Calvary. During the last three years and a half, or the last half of the seventieth week, the work of confirming the new covenant was given to the apostles. Christ did the work through them. They were His agents. This work of confirming the new covenant among the Jewish people for one week began in the autumn of A. D. 27, and ended in the autumn of A. D. 34. Verse 26 speaks of Messiah being cut off. Verse 27 tells definitely when, by saying that “in the midst of the week He shall cause the sacrifice and oblation to cease.” This evidently refers to His death, when all the typical sacrifices met their antitype in Christ, the Lamb of God. 8. SEVENTY weeks were cut off from the first part of the 2,300 days. They related especially to the Jews and Jerusalem. (See verse 24.) The seventy weeks ended in A. D. 34. This date is marked by the martyrdom of Stephen, the rejection of the gospel by the Jewish Sanhedrin, and a great persecution of the Christians, which caused them to be scattered abroad, and they went every- where preaching the word. Acts 8:4. The next year, A. D. 35 (see Acts 9), Saul was converted and called to be the apostle to the Gentiles, and the gospel has since been preached among all nations, and not to the Jews only. 9. WE conclude that the seventy weeks of Daniel 9 form a part of the 2,300 days of Daniel 8, and begin at the same time, for the following reasons: (1) Gabriel came to explain the vision. (See Dan. 9:21-23.) This must have been the vision of the previous chapter, because Gabriel had been commissioned to explain that vision, and he had not completed the work, on account of Daniel’s condition. Dan. 8: 27. (2) The only portion of the vision which he did not explain in chapter 8 was that which pertained to the time, mid when he begins his explanation in chapter 9 he begins at once on the question of time. Dan. 9:23. 24. (3) If the seventy weeks and its subdivisions form no part of the 2,300 days, then Gabriel foiled to explain the vision, and hence failed to do the work he was commanded to do. (4) Unless the seventy weeks begin at the same time as the 2,300 days, they would in no way assist in explaining when these days would begin or terminate. Hence we are held to the conclusion that the seventy weeks begin at the same time as the 2,300 days, and that they were given to explain the vision and enable the student of prophecy to know when the solemn session of the judgment will begin. 10. WHEN seventy weeks, or 490 years, had passed away, there would remain 1.810 years of the 2,300, because 490 deducted from 2,300 leaves 1,810. 11. As the seventy weeks, or 490 years, reached to A. D. 34, the remainder of the 2,300 years, or 1,810 years, would reach to A. B. 1844, because 1,810 years added to 34 would make 1,844. Hence the 2,300 days began B. .c. 457 and ended A. i>. 1844. Some have difficulty in reaching this conclusion, because 457, the years before Christ, taken from 2,300 leaves only 1,843. They cannot see how 1844 can be the true date. The difficulty is imaginary, however, and not real. 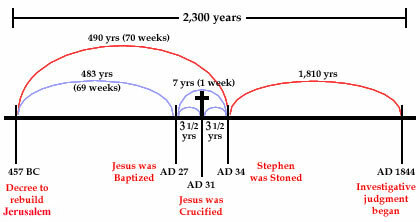 Please notice that it would take 457 full years before Christ and 1,843 full years after Christ to make 2,300 years. Hence if the period of 2,300 years began with the first day of B. c. 457, they would not end till the first day of 1844. But as this period did not begin till the fall of B. c. 457, or when the year was about half gone, it would not terminate till the autumn of 1844. Beckoning from the autumn of B. c. 457, there would be only 456 J years before A. D. 1, and reckoning from A. D. 1 to the autumn of 1844 would be only 1,843J years. Adding 456i years, the time before A. D. 1, to 1.843J years, the time after that date, would make just 2,300 years.